Gary Warby, Director Premier Windows, tells us why a little lateral thought could save you thousands! Is your home becoming cramped? It is believe that Britons are living in increasingly cramped conditions. With a growing family space can very easily become a added luxury And it’s not just the things that we have which can make life become uncomfortably cosy. We are all changing our day to day lifes. The statement that the kitchen is the heart of the home has never rung more true. We want open-plan living with lots of light and space. We want to be able to enjoy cooking, socialising and spending quatilty family time together. That’s why according to a recent survey by market research company Bilendi, of the 14% of UK households that are currently considering home improvements, 36% were planning a new kitchen, while 34% wanted a home extension. But extensions can be rather expensive. A minimal 5m x 4m extension will start at the bottom end of the price scale at around £1,600/m2 – and that’s with a very limited specification. The upper-limit is significantly higher but £60,000 plus shouldn’t come as a surprise. This is where Premier Windows can help. 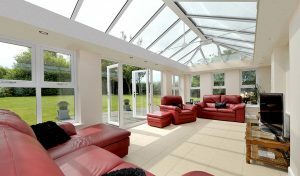 Glazed extensions bring space and light into your home but do so at the fraction of the cost of a traditional extension. These glazed extensions are built around a conservatory frame but feature brick-work pillars and internal boxing to create a much more substantial feel. At the same time they throw are bright and provide a flow and connection between the original house and your new living space. A good example is the LivinRoom. This adds an internal steel work ladder system to the eaves and glazing bar positions of a classic glazed roof. This is the foundation for a screwed to steel plasterboard framework, which forms the basis of a ‘traditional’ internal plaster ‘soffit’ perimeter ceiling. They’re suitable for a wide variety of uses from kitchens, to offices and playrooms. Adding a modern bi-folding or inline sliding patio doors, also provides a great flow out to your garden, seamlessly connecting indoor and outdoor spaces. Take time to understand how your new extension will work with the rest of your property. By adding an extension will it make your current home dark? Glazed extensions allow for lots of light to shine through which make your home brighter. How do you intend to use the room? Consider and plan how you will use your room. If you’re intending to use your hybrid conservatory as a kitchen, think carefully about how you’re going to use it and the placement of large features. How is your extension going to connect to the space outside? It’s not just about decking and paving but how your room opens up onto the landscape beyond. Bi-fold and inline sliding doors are a great way of maximising space by opening up your room to the outdoors. How will this impact on your design? Your supplier – it’s a big investment and one you’re going to have to live not only in but with! Work with an accredited and trusted supplier who will make time to understand your design ideas and help turn them into a reality. Premier Windows offers a complete range of conservatory options and we can support you through the whole process from concept design to delivery. For more information, please don’t hesitate to email me on enquiries@premwindowsanddoors.co.uk or call a member of our team on 01296 422 842.